In 1991, when the Soviet Union was coming apart, Alexey Titarenko was out in his native Saint Petersburg, trying to make sense of what he saw—a surge of people outside a steep entrance to the subway. “I was walking on the street, absorbing what’s happening. And passing by a subway station I see this sea—this ocean of desperate people trying to get inside,” he recalls in his strong accent, carefully enunciating his words. Although street photography was not his usual approach, Titarenko had had a long-standing interest in making art with his camera. In his head, he heard the somber music of Dmitri Shostakovich, a favorite composer. “The beginning of the Second Cello Concerto is like a long-exposure image by itself,” he says, “and the melody of the cello is so long and so tired.” Together the sight and sound suggested a way to make a photograph that reflected the slow-moving gravitas of the scene. He decided to take photos of it using a shutter speed several minutes long. In the resulting images, the crowd blurs into a ghostly mass, but certain forms remain visible. A sense of weight and darkness emerges, and the world is transformed into something metaphoric. A hand appears at intervals along the metal subway railing, hinting at the plodding rhythm of the crowd, while behind it, the city is gray and leafless. A pair of shoes sits forlornly at the bottom of the frame, as if their owner had dematerialized. But Titarenko was not interested in making images that recorded only the surface of what he saw. “What is important is how we feel,” he says. Since “City of Shadows,” he has produced a series of emotionally intense, painstakingly printed black-and-white photographs of several cities. His work has been shown in festivals and museums around the world, including the J. Paul Getty Museum in Los Angeles and the State Russian Museum in Saint Petersburg. Recently he had a solo exhibition at C. Grimaldis Gallery in Baltimore. In New York he is represented by Nailya Alexander Gallery (run by his wife), where his work sells for between $2,500 and $6,000. Above the sound of water running in washing trays in his Harlem basement darkroom, Titarenko, 51 [update] years old but boyish, with a shaggy, gray-tinged bowl cut, explains that city photography did not always appeal to him. Growing up in the Soviet Union, he says, “I hated street photography because for me it was always a tool of propaganda,” which depicted only sanitized, government-approved scenes. But an interest in photomontage, Dadaism, and Constructivism drew him as a teenager to the underground photo clubs of the 1970s. There he began to see that this method could have an honest critical voice. “People in these clubs were taking pictures that were not allowed to be published,” he recalls. Whatever his subject, Titarenko seems to deeply enjoy printing his work, spending hours in his red-lit darkroom listening to classical music. By burning, dodging, solarizing, bleaching, and toning sections of each print, he highlights different details and produces versions of the same negative with slightly varying resonances. Reprinting older negatives, he says, “I’m actually apprehending the image more and more. I see more there, because the negative has thousands of details. It pushes me to emphasize something I just didn’t see in the first place”. Rebecca Robertson is co-editor of New York Photography Diary. 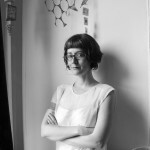 She is a freelance writer, curator and photo editor in Queens. She studied photography and art history at Bryn Mawr College and received her MFA in photography and related media from the School of Visual Arts. She has worked in the New York art world for more than 10 years. She has written about photography for ARTnews magazine and curated shows, most recently a series of benefit exhibitions for UNICEF. A version of this story originally appeared in the June 2014 issue of ARTnews.